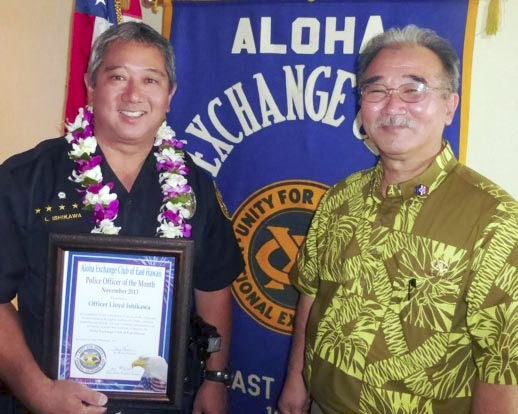 Aloha Exchange Club president Jay Kimura presents an 'Officer of the Month' plaque to Lloyd Ishikawa. The Aloha Exchange Club of East Hawaiʻi recognized Officer Lloyd Ishikawa on November 21 as the East Hawaiʻi “Officer of the Month” for November. Ishikawa, a Puna Patrol officer and former “Officer of the Year,” was honored for piecing together information that led to the arrest of a wanted man considered armed and dangerous. On September 30, police responded to a report that a man had fired several rounds from a silver Mazda Miata in the Panaʻewa area of Hilo. In the days that followed, Ishikawa was provided with the identity of the suspect and shared the information with his fellow officers. One remembered being sent to Fern Acres a few days earlier, where the property owner reported a silver Miata parked on the vacant lot. Checks of the license plate at that time had not shown the car as being stolen or belonging to a wanted person. On October 3, Ishikawa went to the Fern Acres property and observed fresh tire tracks leading up the driveway. After obtaining permission from the property owner to proceed onto the lot, he returned at dusk with a team of officers and discovered additional fresh tire tracks. Ishikawa directed the officers to walk in on foot to retain the element of surprise. When they did, they observed three vehicles on the property, including the Miata, a stolen pickup truck and a stolen Mercedes Benz. The doors, hood and trunk of the Mercedes were open. Two people, who were standing next to it, fled into the bushes but were quickly apprehended. One of them was the suspect in the shooting. A semi-automatic pistol was on the seat of the open Mercedes. Inside the Miata was a spent firearm cartridge. After the arrest, Officer Ishikawa contacted the registered owner of the Miata, who was on the mainland and unaware that the car had been stolen. Ishikawa then made an additional case for the stolen Miata. 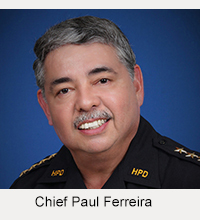 Lieutenant Reed Mahuna, who recommended Ishikawa for the award, said Ishikawa “truly demonstrates” the Police Department’s core values. 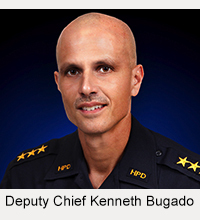 “Officer Ishikawa’s diligence in taking a piece of information, sharing that information to develop leads, and acting on those leads was instrumental in the apprehension of a dangerous fugitive and the recovery of three stolen vehicles, one of which had not yet been reported stolen,” Mahuna wrote in nomination papers. As “Officer of the Month,” Ishikawa is eligible for “Officer of the Year.” In 2011, he was named “Officer of the Year” for his initiative and dedication to duty.